After our jam packed time in lively Kuta, we'd been advised to visit Seminyak - prettier, quieter and a little more upmarket...and one word, SHOPPING. Seminyak is only a 15-20 minute drive away from Kuta but accommodation tends to be slightly more expensive; but I guess you can say that about anywhere depending what standard of hostel/guesthouse/hotel you're after. 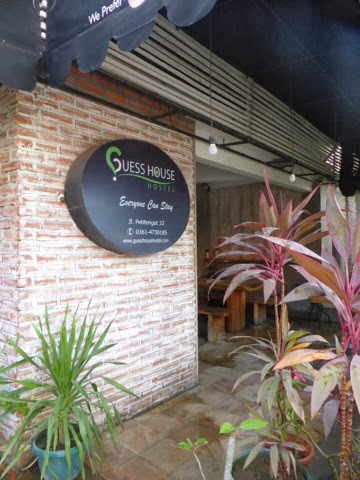 We had a little browse on Hostelworld and came across Guess House Hostel. There didn't seem to be a great deal of choice for budget hostels in Seminyak so we kind of picked this one by default; but I'm so glad we did. The place was lovely; modern in exterior, clean everywhere (even the showers and toilets - a rarity in a lot of SE Asia), a sofa and TV area in reception and newly decorated dorms with lots of space, big bunk beds and secure lockers for your belongings. It was around 7 pounds per night, which was a couple of pounds more than we'd previously been paying but definitely worth it for a couple of nights in a nice area. 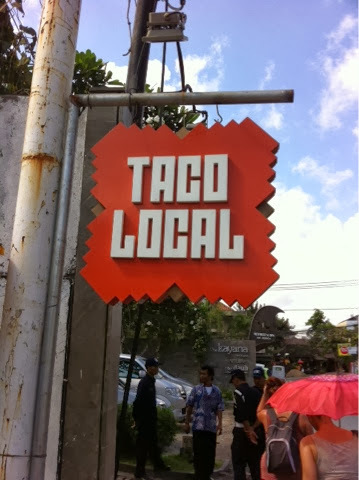 On our first day night in Seminyak, a couple of other English people were sharing our dorm with us, so we all headed out to Taco Local for possibly the best Mexican I have ever had...ever! You know I love food; I don't exaggerate when something is 'the' best. Myself and two of the girls shared a nacho starter then I devoured a shredded beef burrito - the meat fell apart, the rice was delicious, the gucamole was almost as good as my homemade and the melted cheese...wow, just wow. 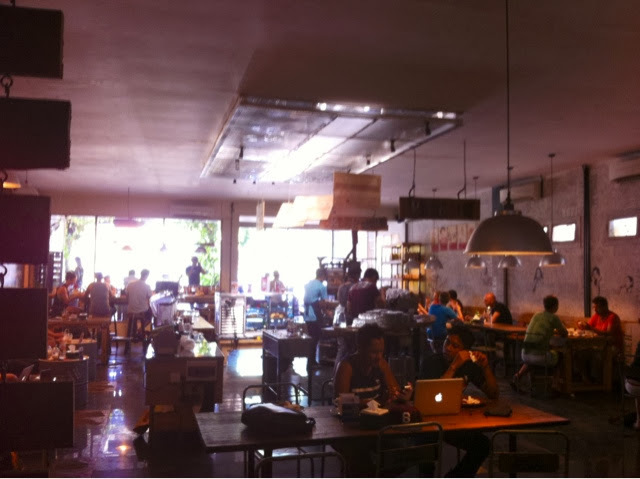 Visiting Seminyak? Go to Taco Local! Another place I wouldn't have minded visiting was the restaurant Petitenget. If you fancy a nice recipe, have a look back on my archives and you'll stumble across my poached egg, feta and asparagus on sourdough delight - this is something I found on Instagram which is ironically from Petitenget! Unfortunately, I didn't get my breakfast here but we went to a really nice bakery, Gourmet Cafe, round the corner that did amazing smoothies and salads, as well as the talked about Cronuts and beautiful pastries. As well as heading to Taco Local, we also ventured out in search of a nice bar to go to. We'd been told about Potato Head but had no idea what to expect; the name itself doesn't exactly scream out anything too positive. We at the corner of the street with the sign pointing down a long drive way. Walking down, we arrived at a huge building, fronted with different coloured and sized shutters - we'd arrived at Potato Head and it looked amazing, definitely not what we had expected at all. Right on the beach front with beautiful beach beds, quirky seating, funky music and an incredible infinity pool overlooking the ocean - this place was fashionista central. We sat down, looked at the menu and were greeted with a very appealing list of cocktails. Make sure you check out Potato Head, even if it's just for the view. We headed back to the hostel and caught up with friends and family in the UK before getting a relatively early night. The next day we had arranged for a driver to take us to Dreamland, a beautifully picturesque beach - surfers paradise and, apparently, the ultimate place to relax - as well as Uluwatu to see the sunset. Uluwatu is a temple, overlooking the ocean, and filled with monkeys (warning: remove your sunglasses/anything they can grab). The car and driver for the day was 400,000 IDR (about 20 pounds) which is really good, especially when you're in a new place and lacking in any sense of direction. Dreamland is hidden away in the Pecatu resort, an impressive, up and coming area that reminded me a lot of Dubai when I first visited around 12 years ago - the nice time in the emirate where it wasn't touristy, Jumeriah Beach Road had a few hotels on and we stayed at Jumeriah Beach Hotel, overlooking the Burj being built (yep, that long ago!) The Pecatu resot had big statues at the entrance and on the roundabouts, something that seemed so extravagant compared to the poor efforts of the English ones, with palm tree lined roads and a stunning view of the ocean; I had a feeling Dreamland may live up to its name. 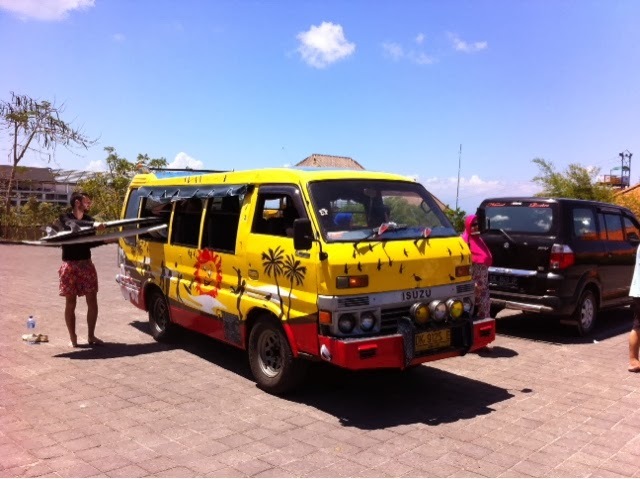 We were driven through the resort to catch the free shuttle bus down to Dreamland (or New Kuta Beach as it's often called). It didn't look like much as we were dropped off by some scruffy steps, walked by a few worn buildings and by some murky water, but as we walked further down, we were met with white sands, the ocean scattered with surfers and caves hidden away in the stone surrounding the beach. Okay, so I'll admit, it was pretty damn nice. When we arrived, there were a comfortable amount of people, all relaxing, paddling in the ocean and admiring the impressive surfing going on a little further out. I headed off on my own for a walk up the beach and came across the quiet part - no sunbeds, hardly any people and a chance to have a sit down, stare out to the ocean and have a little time to myself. I've loved every minute of travelling with the girls but spending every day together, sharing rooms, going on trips etc, you don't get any time to yourself, not even an hour so being able to have this 20 minutes so sit, reflect and lose myself in the beauty of where I was was really nice. I headed back up the beach to my sunbed to make the most of the tanning time as we only had a couple of hours before we had asked our driver to take us down to Uluwatu. Be warned - Dreamland is touristy. The quiet end of the beach remained quiet but by 3.30pm there was literally a huge bus load of people and Dreamland didn't seem so dreamy anymore. You have to pay for sunbeds, as you do in most places anyway, the standard 'hi lady, massage, manicure, pedicure' people surrounded you and you even had to pay to use the showers but these things are expected now; they have to make a living somehow. 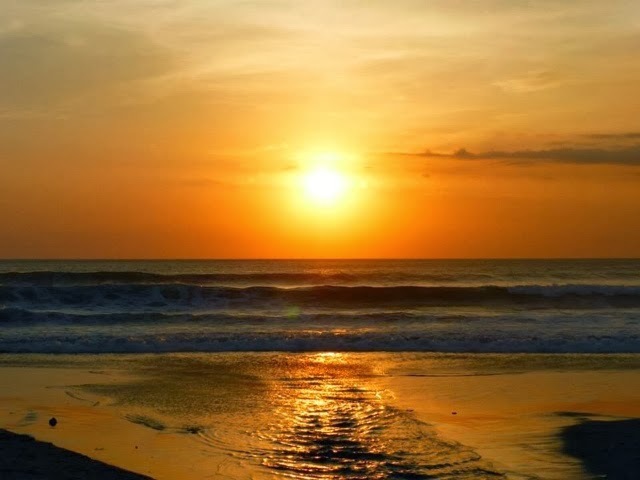 So, a word of advice, by all means go to Dreamland - it's beautiful but it's not a hidden, quiet beach like you would want it to be and there are much nicer beaches in Bali to visit. The problem is, the most stunning beaches will be shared with other tourists and travellers so if you find a quiet, hidden beach - keep it that way. The best kept secrets are just that, secrets. 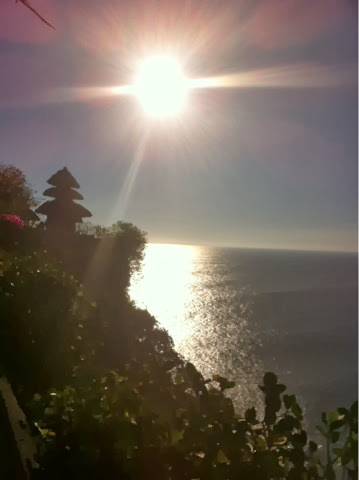 From Dreamland, we headed to Uluwatu - a religious site renowned for it's amazing view of the sunset. Yet another place filled with monkeys, the pesky things still make me nervous and I found it hard to relax with them loitering round the whole time. We arrived at Uluwatu around an hour and a half before sunset and there isn't a great deal there. We waited at the end of the long walk way on the cliff edge with the temple in the distance and made the error of walking further round and not having the best angle to view the sunset. I was a bit disappointed and preferred the beautiful sunset we had seen the previous day over the ocean on the beach, only a 5-10 minute walk from our hostel but still managed to get a few nice pictures all the same. I had heard better things about Tanah Lot but we unfortunately didn't get chance to go there as well and there would be other sunsets. After Uluwatu, we headed back to the hostel, tired and hungry. We had our showers, got ready and headed down to a local Warung (their equivalent of a cafe) in search of some traditional Indonesian food. We had been told about a good one just round the corner, almost opposite Gourmet Cafe with a little fish tank in the front. Since being away I've been craving salads where I can get them due to the masses of noodles and rice on every menu so ordered myself a tomato salad - and it was literally a plate of tomatoes! Luckily could eat them by the bucket load but the Indonesians can be so literal sometimes! For main I had a gorgeous chicken sate with a side of vegetables and rice. Very impressed and very cheap so eat local where you can because it will not only save you money but the food is almost always delicious, speaking from experience. 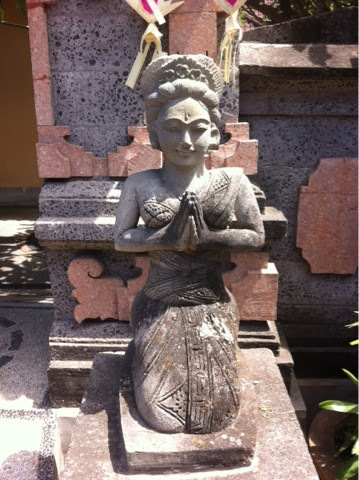 After traipsing around for a while, we had arranged for a 4pm pick up to take us to our next destination, Ubud. We had a bit of a mix up with our driver, who had agreed to take us but then called work that morning to say he was off, so ended up being taken by the owner of the business. The drive from Seminyak to Ubud was only around an hour to an hour and a half so we snoozed and arrived just in time for dinner. 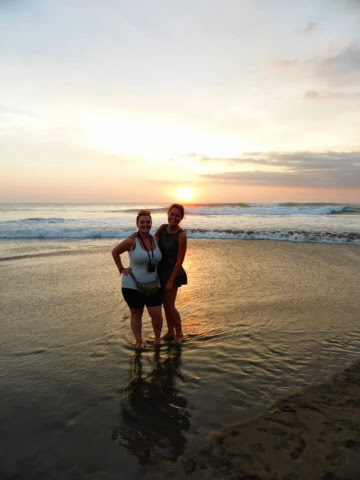 I loved Seminyak and can honestly say, I think I could live there. There was a job in a coffee shop and with two years barista experience under my belt, I was half tempted to apply. After less than a week in Bali, I already loved the place. As we were walking around I saw a few lovely restaurants and bars I desperately want to try when I next visit - Olive Bar, The Deck, The Junction and Petitenget, as mentioned before. If any of you ever venture to any of them, please let me know what they're like, you know I love a recommendation!